website is no longer active, take a look at our recommended sites. 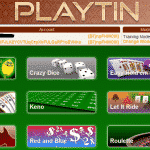 Playt.in is an online Bitcoin casino that accepts both Bitcoin and Litecoin currency. In the growing online gambling Bitcoin market, Playt.in seeks to attract players by offering well optimized games, secure and anonymous service for online transactions and a fair chance for winning big. 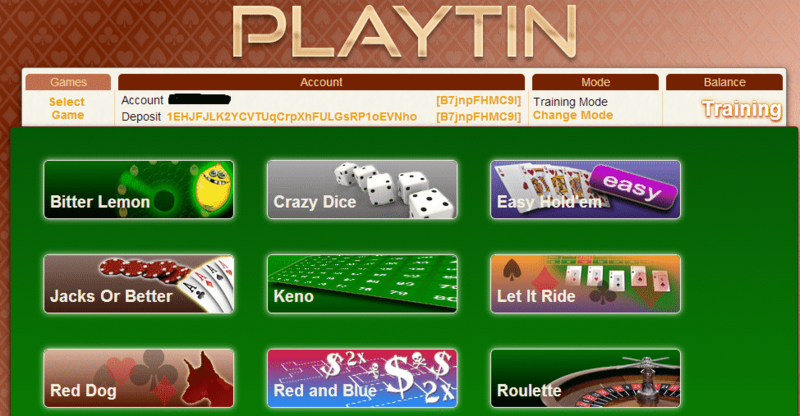 The site offers several ” casino modes” for playing – training which is intended for practice and getting to know the games; Milibitcoins [mBTC] for playing with Bitcoins; Litecoin Cents [cLTC] for playing with Litecoin and Trading (assets & coins). Players can transfer seamlessly from one mode to the next depending on their preference. The last option can be of great use to players who like to transfer funds from one service to the next, with acceptable rates and instant transfers. Playt.in won’t impress you at first sight, since it boasts a rather simplistic and dull design. The bland background theme along with the basic game design does not improve things as well. On the plus side, the casino uses HTML5, meaning crisp and smooth game play experience in your browser, without the need of any additional downloads. The site is optimized for work in Chrome and Mozilla Firefox. While simplistic and without any real quality from designer’s perspective, the games are well made and are easy enough to just pick up and play. As noted previously, all games that are part of Playt.in’s offer can be played using Bitcoin or Litecoin depending on the player’s preference. The payments and placed bets are measured in either mBTC (miliBitcoins) or cLTC (Litecoin cents). All games have Provably Fair technology implemented which serves as a proof for authenticity and can be used to get evidence that the casino is not rigging the results. This is a fun and interesting take on a lottery type of game, with the possibility to either win a sum of 10, 20, 30 or 50 coins or hit a bitter lemon which doesn’t award anything. There is a special bonus in the form of 5 free games which can be hit for playing for free and still having a chance of winning. Dice game lovers will find this game appealing from the get go thanks to its easy to learn, hard to master game play. Players can choose to roll either Hi or Lo versions of the 6 dice, meaning the sum of the rolled dice has to be either lower than the one on screen or higher, sequentially. This version of the popular Texas Hold’em contains all the hallmarks of the original like the card rankings and prizes, though with a more simplistic approach to graphics and animations. The rewards carry over with some bonuses that can be triggered when playing for a longer period of time. Currently, PLayt.in casino doesn’t offer a live chat or direct email option, though you can always contact them via their official mail listed on their customer support page. Playt.in operates using either Bitcoin or Litecoin on a secure and private PLAYTIN wallet, with multi-currency support and anonymous, instant off-chain transactions. There are no fees associated with the online transactions and everything is processed instantaneously. Playt.in uses SSL encryption and cold wallets to conduct all online transactions and ensure no data loss occurs, ever. The coins are all transferred offsite for better safe keeping. The security is always on a very high level since players do not offer up any personal information that can be exploited by malicious hackers, and their Bitcoin address is safe thanks to the site’s internal firewall protocols. With two options for making payments and receiving winnings securely and instantaneously, Playt.in casino drives a great bargain for players who prefer Bitcoin and Litecoin for their online gambling activities. While the games and the site’s presentation would certainly benefit from a makeover, there is enough variety and rewards to keep you coming back for more.